The original Mini is one of a tiny handful of vehicles that are truly iconic, immediately recognizable even by people who know nothing about cars. It’s as enduring a symbol of sixties Britain as the Beatles and James Bond — a revolutionary little shoebox on wheels that rewrote the rules for compact cars. 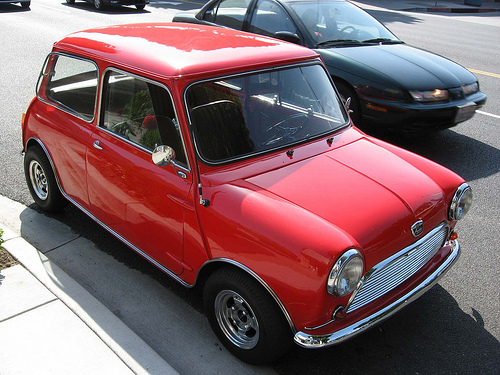 This week, we look at the history of BMC’s original Morris and Austin Mini. Just as the first Big Three compacts of 1960 emerged from the “Eisenhower Recession” of 1957–1958, the Mini was born in crisis. In October 1956, the British and French governments made a secret agreement with Israel to retake the Suez Canal, which Egyptian president Gamal Abdel Nasser had nationalized that summer. Israeli armed forces advanced into the Sinai Peninsula to provide a pretense for an Anglo-French task force, dubbed Operation Musketeer, to invade Egypt, ostensibly to ensure the security of the Canal Zone. However, U.S. President Dwight Eisenhower refused to support the invasion and exerted strong economic pressure on Great Britain to withdraw. The Musketeer task force sailed for home less than 10 days later, but the incident prompted Saudi Arabia to impose an embargo on oil shipments to France and the U.K. The Suez Crisis and its aftermath nearly collapsed the British pound, brought a brief return to fuel rationing in late 1956, and devastated new car sales in the U.K. Overnight, panicked British buyers turned to tiny, German-made “bubblecars” like the Isetta, Messerschmidt, and BMW 600, which were smaller and more frugal than any contemporary British-made car. 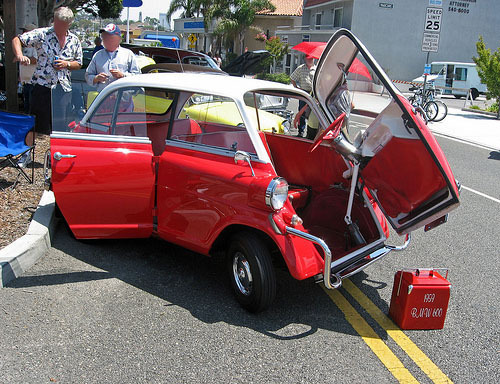 The short-lived BMW 600 was an upscale bubblecar, an upgraded version of the Isetta. It’s only 114.2 inches (2,900 mm) long, powered by a 582 cc (36 cu. in.) flat-twin motorcycle engine. The situation alarmed every British automaker, but it was of particular concern to the British Motor Company (BMC), the conglomerate formed from the 1952 merger of Austin Motors and the Nuffield Organization, which included Morris, MG, Riley, and Wolseley. BMC had controlled a sizable percentage of the British market before Suez and the new German invasion represented a serious threat. Aside from the business implications, BMC chairman Leonard Lord reportedly took personal offense to the bubblecars and was eager to create a competitive home market alternative. BMC’s chief engineer at that time was one Alexander Arnold Constantine Issigonis. Born in Smyrna in 1906, Issigonis was a British subject, but he and his mother did not move to England until 1923. Issigonis studied engineering at Battersea Polytechnic, where he famously failed the mathematics exam three times. After a stint as an engineer for Humber and some amateur racing efforts, he joined Morris in 1936 as a suspension engineer. Although Issigonis was still relatively junior in 1943, Morris chief engineer A.V. Oak allowed him to design the company’s first postwar car, which emerged in 1948 as the Morris Minor. The Minor was a curious-looking car, but it was quite advanced for its time, with unitary construction, independent front suspension via torsion bars, and rack-and-pinion steering. It became one of Morris’s most-important products, selling almost 1.4 million copies between 1948 and 1971. 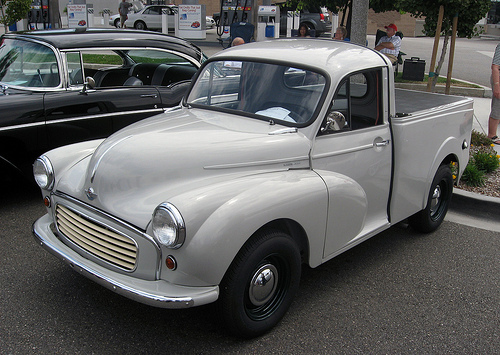 One of the many derivatives of the Morris Minor was this compact pickup truck. This is a Minor 1000 with the 948 cc (58 cu. in.) version later used in some Mini derivatives. The success of the Minor won Issigonis great favor with Morris management, who quickly learned that he could do great things if they stayed out of his way. Issigonis was as stubborn as he was iconoclastic and diplomacy was not among his strong suits. He did not suffer fools gladly and had an unapologetic loathing for styling and marketing. Issigonis briefly left Morris in 1952, following the formation of BMC. Fearing that he would not enjoy the same autonomy under the new, Austin-dominated management, he went to Alvis, where he and Alex Moulton worked on a V8-powered luxury car using Moulton’s new Hydrolastic interconnected suspension system. That project was canceled in 1955 and Issigonis accepted Len Lord’s invitation to return to BMC as chief engineer. At the time of the Suez Crisis, Issigonis was working on a new family sedan to replace the Minor. Code-named XC9000, its shape would have been immediately familiar to any later Mini owner, although it was a conventional rear-drive car. In March 1957, Lord asked Issigonis to put the XC9000 on the shelf and develop a new, smaller car to challenge the bubblecars. The new project was code-named XC9003. By the mid-fifties, BMC had developed a reputation for conservative engineering and product planning. Len Lord had great faith in Issigonis, however, and gave him a free hand for the XC9003 project. The one proviso was that it had to use an existing engine — BMC did not have the money for both an all-new car and an all-new powerplant. At that, BMC did not have a lot of money, period; even before Suez, its financial condition had been far from robust. The tooling budget for the XC9003 was a modest £10 million, about $28 million at contemporary exchange rates, perhaps $220 million today. Issigonis did not let the lack of capital dampen his ambitions. His goal for the XC9003 was to provide room for four adults in a car only 10 feet (305 cm) long and 4 feet (122 cm) wide. Such packaging made a conventional front-engine, rear-wheel-drive (FR) layout impractical; it would require either a front-engine, front-wheel-drive (FF) or rear-engine, rear-wheel-drive (RR) configuration, both of which were uncommon in Great Britain at the time. Citroën, of course, had used front-wheel drive since the mid-thirties, while some German and Italian automakers had opted for RR layouts, but most British manufacturers remained firm adherents of the front-engine, rear-wheel-drive layout. BMC did briefly study rear-engine layouts in the late fifties, but Issigonis was convinced that front-wheel drive was the way of the future. The problem was packaging. Most early FWD cars, like the Citroën Traction Avant and the American Cord, had longitudinally mounted engines with the transmission mounted ahead of the engine — a bulky arrangement even with a four-cylinder engine. As a result, while FF cars were more efficient in their use of interior space than FR contemporaries, they were not necessarily any smaller. Issigonis decided that the solution was to mount the engine transversely, a concept he had studied even before his sojourn at Alvis. A transverse engine would be much shorter than a longitudinal engine, but it presented an additional problem: where to put the transmission. The XC9003 was wide enough to mount the Austin/BMC A-series four between its front wheels, but it was not wide enough for both the engine and transmission. Issigonis considered cutting the A-series engine in half, creating an inline two, but the resulting twin was hopelessly gutless, even for an economy car. He finally resorted to mounting the gearbox in the engine sump, sharing the engine’s oil supply. It was a simple solution, albeit a daring one; engines and transmissions have very different oiling requirements and a compromise suits the needs of neither. Nevertheless, this solution reduced the powertrain’s total length to a mere 18 inches (460 mm). The familiar Austin gearbox, a four-speed with an unsynchronized low gear, was far from happy in its new role. The prototypes routinely broke their synchronizers and there was neither time nor money to redesign the transmission before launch. As a stopgap, Issigonis turned the engine 180 degrees, using spur gears to drive the transmission. The additional gears reduced the load on the synchros, although the gearbox would remain a weak point of the early cars. The XC9003 was originally slated to use the 948 cc (58 cu. in.) A-series engine, shared with the Morris Minor 1000, but prior to production, the engine was de-stroked to 848 cc (52 cu. in.). The smaller displacement reduced output to a modest 34 net horsepower (25 kW), but provided better fuel economy and better range from the tiny fuel tank, whose capacity was only 6.5 U.S. gallons (5.4 Imperial gallons, 24.7 liters). Every aspect of the XC9003 was carefully designed to maximize packaging efficiency. Like the Minor, the new car had unitized construction, although front and rear suspension subframes were added late in the development process to reduce the stresses on the body shell. Inside, the seats were extremely upright, improving legroom without increasing the length of the cabin. Nearly every scrap of usable space was put to good use. 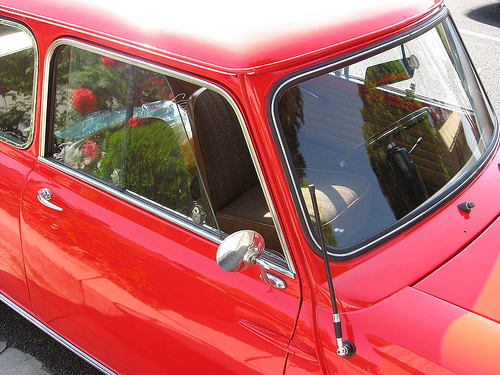 As a cost-saving measure, early Minis had exposed door hinges and sliding windows. The use of sliding windows also saved enough space to allow capacious storage bins in each door, part of Issigonis’s original design specification. All Minis received concealed hinges and wind-up windows in 1969 with the introduction of the Mk3. The XC9003 had rack-and-pinion steering and fully independent suspension: double wishbones in front, trailing arms in back with no anti-roll bars. The new car was originally supposed to have Alex Moulton’s Hydrolastic springs, but the scaled-down Hydrolastic suspension wasn’t ready in time, so compact rubber springs were substituted at the last minute. The Hydrolastic system would resurface several years later. Perhaps the most noteworthy space-saving measure was the 10-inch (254mm) wheels. Their size allowed the wheelhouses to be kept as small as possible, improving packaging efficiency. They also reduced unsprung weight — an important consideration in a car whose sprung weight was barely over half a ton (454 kg). At the time, no manufacturer made wheels or tires that small, so Issigonis and Lord persuaded Dunlop to make some. There would later be an entire cottage industry creating wheels and tires for the little car. Very well written article. Incidentally, this site, Aronline and TTAC is my top three car sites on the net. I really like all the extensive research that goes into all of the articles on this site, it’s truly a watershed of hard facts and knowledge. Good work, really good work. Superb writing…really enjoy your site…thanks! Always learn something new when I visit. i would like to get more picture of modify and non modify mini…how many more does BMC has produce. My Dad bought a new Morris Minor ‘woody’ in 1959. The two-lane highways back then were a real adventure, especially in something like the Morris, and I vaguely remember leaving early from our camping trip because it got so bloody hot. Dad finally sold the Morris and got a ’61 Falcon wagon and the family did a lot of trailering and camping in that. I liked the Morris, and one like ours is undoubtedly the most collectable version today. I never knew that Issigonis was the designer. in the sentence "Badged miniMetro, it didn’t go on sale in October 1980.". Great article and site – engages pretty much all my interests. Oops! Yes, at one point, the sentence read, “…finally arrived in October 1980,” and when it was restructured, it lost an article or two. Fixed. I had to look up the 9x, which is of course @ Austin Rover Online. Nearly every BMC model launched after the ’50s seemed to suffer the same problems. The Mini, 1100/1300, 1800, Maxi, Allegro and Princess cars were not developed properly before launch, none of them had a decent gearchange and had poor transmission reliability, apart from the Maxi and Princess they had an awkward driving position, and all models had below par build quality. Poor build quality became an issue for the Rover, Triumph and Jaguar cars as well, although only Rover had anything like a decent reputation in their pre British Leyland forms. Appalling management and irresponsible trade unions both contributed to this sorry situation. I read in Sir Micheal Edwardes book “Back from the brink” that soon after he was appointed managing director of the company he asked his department heads for costings and profit margins for the models in production. NOT ONE OF THEM HAD ANY IDEA, it appeared they simply built the cars and assumed if they left the factory in reasonable numbers a profit was being made. The Mini is a good example of poor planning, it was priced to compete with the ancient flathead engined Ford Popular which had long amortised its development and tooling costs. It was never going to sell any cars to someone thinking of a small Ford, they might look at a Morris Minor or Austin A35 instead. Perhaps if more development had been done with a profit margin built into its price structure who knows what might have been?. In regards to your last point, isn’t that really what Leyland did with the Metro? Same old pre-flood A-series engine, same gearbox in the sump, Hydragas suspension, similar packaging, but modern styling, a hatchback (which the Mini should have had much sooner), and a lot of canny production engineering so they could actually build the cars without losing money on them. It was such an obvious development that one really has to wonder why BMC/BLMC didn’t launch such a car in, say, 1970 — they had all the pieces, and British Leyland would have weathered the ’70s much better if they’d had a volume product on which they made more than a fiver per car. I believe Sir Alec Issigonos did have a replacement for the Mini in at least in blueprints by the end of the ’60s. It was rather like the Metro launched ten years later, at least in concept, and looked somewhat similar, probably more due to the dictum of “form follows function” than anything else. It’s hard to tell most modern superminis apart from any distance as they all have the same function to fulfil. Leonard Lord and Issigonis didn’t see eye to eye on many things, as with GM and Ford top executives politics played its part as well. Internal politics is a major factor in the various trials and tribulations of any large corporation, be it shipbuilding, banking, or vehicle manufacture. By that time of course British Leyland was in complete confusion, money being siphoned off from Leyland Trucks to prop up the ailing and infighting car divisions. By 1970 British Leyland was under threat from European makers as well as domestic rivals Ford UK, Vauxhall and Chrysler UK. Japan had given notice that reliable cheap cars could be made, although they only had a toehold in the marketplace at the time. But I think it fair to say the only car to compete directly with the Mini was the Hillman Imp, a rear engine design that rivalled the Minis excellent handling along with its cramped, noisy interior and lack of luggage room, other cars in its price range included the Renault 4, Citroen 2CV, Fiat 500 and Skoda 1000. The Renault was more reliable, more comfortable and had more room for passengers and luggage, but was a bit more expensive, slower and not fun to drive, the Citroen was a bit too quirky for British mass appeal, the Fiat even smaller and more cramped without good road manners, and the Skoda was an Iron Curtain anachronism. Early Imps were notorious for water pump falures and it also hadn’t been properly developed before its launch. If anything it was even less reliable than the Mini so the Mini had its niche at the bottom of the pile more or less to itself. Perhaps for that reason, as well as no spare funds for developing a direct replacement it was left to soldier on for so long. By the time it went out of production it was selling purely because it was a Mini, it was no longer cheaper than its rivals which had long ago overtaken it as a fun to drive car. Around the time of the merger, Issigonis did come up with the 9X, which had a hatchback and some other updated touches. What the later Metro had that I’m not sure the 9X did was the attention to cost engineering. After the merger, Leyland hired a lot of ex-Ford people, who had the built-to-cost thing down to a science compared to BMC. Not all of those people stuck around long, of course, but those lessons did eventually filter down to the Metro. Issigonis was brilliant in many respects, but given his feelings toward stylists and marketing executives, one imagines he would have been very reluctant to compromise his designs on the say-so of cost accountants or production men. The speed with which the BLMC board moved Issigonis out of the technical director post suggests that Stokes wasn’t having any of that. I haven’t gotten to the Imp yet, nor any of the other Roots Group products, but I’ll be dealing soon with the first Fiesta and Ford’s own approach to this market. Hi.. Just a small incorrect detail.. Bottom of page 2 “in October 1967, the new Mk2 models received luxuries like wind-up windows and internal door hinges.” Those changes didn’t actually happen until the Mk3 model of ’69. Personally I think of that as the end of the pure Mini design.. The large door bins, facilitated by the sliding windows, would take half a week’s shopping. Another simple genius Issigonis feature lost to styling on the later Minis was the gravity-hinged rear numberplate holder, so you could drive with the boot (trunk) lid open full of luggage and still have the illuminated plate visible. Between that and the door bins the Mk3 probably had half the luggage capacity of a Mk1 or Mk2. Thanks for the correction — I’ve amended the text. I don’t believe the 948cc version of the BMC A series engine was every used in the Mini. Minis began with an 850cc then jumped to 998cc (a big bore version of the 948) and numerous other A series displacements over the decades with 1275cc being the largest, beginning in about 1967 with the Mini Cooper S.
The text doesn’t say otherwise, though — it just says, “The XC9003 was originally slated to use the 948 cc (58 cu. in.) 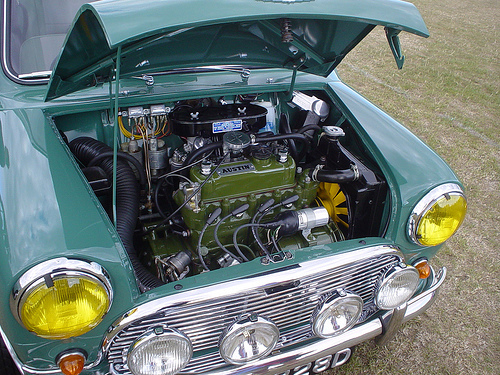 A-series engine, shared with the Morris Minor 1000, but the engine was subsequently de-stroked to 848 cc (52 cu. in. ).” I suppose it could be clearer that it meant the change was made during the development process, not in production. Minis were originally equipped with 850cc engines, the Cooper models had 998cc and 997cc engines, one a long stroke unit, the other a short stroke, (I don’t know which was which). The 998cc engine in detuned form was put in the Wolesley Hornet and Riley Elf models and the Mini 1000 from 1968. Cooper S models had a choice of 957cc, 1071cc and 1275cc engines. The smaller sizes were presumably for competition classes, with as short a stroke as could be made from the A series design. In the mid ’70s the 1098cc version from the Austin 1100 and Allegro was fitted to Clubman models. The A series started life as an 803cc unit in the Austin A30, growing to 948cc, 1098cc and 1275cc in various rwd models. The crankshaft was rather different in fwd applications, instead of a flange with a bollted on flywheel they had a tapered spigot extending out and the flywheel was pressed on to it. The 997 was the long stroke version, after about 2 years of Cooper production the 998 was introduced, a larger bore shorter stroke engine. Despite only a 1cc difference in displacement and the same official HP rating it’s a much nicer revving engine. The Mini is one of those cars that deserved a lot more updates and development over the course of its long production life including 4-door (see AROnline) and hatchback variants (albeit with the 4/5-door initially limited to the 848-998cc engines in order to not steal sales from the BMC ADO16 1100/1300) as well as Rover Metro/100-style hydragas suspension. The 9X was said to be potentially cheaper to build and more profitable then the Mini, its only failing being that it was a clean sheet design at a time when British Leyland was formed. Mini: The Definitive History by Jon Pressnell has a lot of useful information on stillborn projects to update the Mini, during development a prototype Mini did use the 948cc A-Series which made the Mini too fast at 90 mph and as a result a decision was made to fit the Mini with 848cc version of the A-Series, the other short-lived alternative being to revive the 803cc engine. Anyway more information on the all-alloy A-Series project can be found in Post War Baby Austin’s by Barney Sharratt. Obviously they could have costed the Mini better during development and charged a bit extra at BMC (possibly with Joe Edwards replacing Leonard Lord instead of George Harriman) though the likes of the Maxi and 1800/2200 underperforming and not being properly developed certainly did not help either. Also upon BL being formed the main priority was to rationalize projects from overlapping marques and attempt to help Morris/Austin perform better in the mid-range sector. Still with the amount of money (from millions to tens of millions) BL spent on still-born projects (a few of which were Mini-replacements), would have likely been better spent on further improving the Mini. While the Metro was originally intended to be a Mini replacement, it never quite achieved its objective and was more compromised and characterless then it needed to be, such as not receiving front/rear-interconnected hydragas suspension from the outset (instead of later appearing in the Rover Metro/100) and being limited by the gearbox-in-sump layout. The latter was probably the biggest miscalculation from a mechanical design standpoint. Hydragas had its pros and cons (the French managed better ride and better handling with conventional hardware), but having the gearbox in the sump meant they were limited to four speeds long past the point where rivals offered five-speeds at least as options. The entire history of BL in some ways boils down to an ongoing mismatch between money and ambitions, leading to evolutionary changes when they needed new models and new models when they’d probably have been better off fixing or updating the existing ones. The Gearbox-in-Sump layout also limited the potential of the 1275cc A-Series Turbo which was capable of 120-130 hp before it was detuned to 94 hp in order to preserve the life of the gearbox. Both BMC and Leyland could have made better decisions which would have removed the need for both to merge to create BL. Well, Leyland was doing okay before the merger (which is why the government pushed for it). How well Standard-Triumph, Rover, and Alvis would have done remaining independent is an interesting question, but they were better-positioned for success than BMC was. They needed to improve quality control and rethink their export strategy — especially with regard to the U.S. — but they had competitive products that were selling well and a more coherent product development plan. It wasn’t a perfect plan, particularly considered with the benefit of hindsight, but there was a plan, which was a good start. With BMC, they needed to quickly rationalize and discontinue low-selling marques such as Wolseley and Riley as well as resolve simmering in-house conflicts between Austin and Morris. Also the success of their FWD products outside of the UK was dependent on Britain joining the EEC in the early-1960s where high tariffs prevented BMC from capitalizing on the success of the Mini, 1100/1300, etc in EEC markets. Morris and later BMC were also unable to make the most of the Morris Minor’s success and develop it into a true rival to the Volkswagen Beetle. Such as spawning OHV and larger engined variants (with postwar 1140-1466cc XP-engined versions being sold alongside the MG T-Type in the US prior to using 948-1275cc A-Series / 1.2-1.6 B-Series engines), Gerald Palmer-styled sporting models with proposed all-independent suspension and even utilizing a form of the FWD Minor prototype along with potentially a early-60s Marina to rival the mk1 Ford Cortina. Though as with other cars he designed including the Mini, Alec Issigonis did not really care to improve existing models even his own preferring instead to constantly build innovative cars (ideally from a clean sheet of paper), hence the lack of development. Leyland meanwhile though it was relatively better positioned compared to BMC had Triumph and Rover overlapping with each other with both marques having already invested tens of millions into new products and engines, whereas Leyland would have been better off acquiring Jaguar to sit above Triumph (with Rover going to BMC). Sir William Lyons went with BMC because he was afraid their acquisition of Pressed Steel would otherwise hurt Jaguar badly, so the latter wasn’t terribly likely. I don’t think assembling Triumph, Rover, and Alvis into a coherent divisional structure was really all that dire an issue, particularly WITHOUT having Jaguar in the mix. (Having to coexist with Jaguar made a mess of Rover’s plans for a good decade, as we’ve seen.) As for Rover and Triumph, Rover didn’t have smaller, cheaper cars or sports cars (I’ve never been sure how serious they were about the P6BS as a real production possibility) and the P8 and its mooted Alvis spin-off were well upmarket of anything Triumph was contemplating. Triumph was of course planning to put the Stag V-8 in the 2000/2500, although it’s entirely possible they would have simply dropped that plan; as it was, the V-8 was seen as a disruption to production of the more numerically important slant-four. The major overlap at the time Leyland bought Rover was in the 2-liter class, and since the P6 and 2000 so dominated that market, the need to decide how (or if) to resolve that conflict was still some years out. They probably would have wanted to rationalize the two lines eventually, although the necessity of that really depended on how well they could have kept the cars competitive against the Germans after 1972. Compared to the morass of problems facing BMC in terms of product development and brand overlap, that doesn’t strike me as impossibly onerous. Rover were serious about the P6BS (initially intended as an Alvis before later becoming the P9) and P8 projects, they also looked into the smaller P10 project to replace the P6 that after the P8 was cancelled grew to become the SD1. Though it is not practical given Sir William Lyons motivations, the rationale behind Rover going to BMC and Jaguar going to Leyland is to allow Rover to grow as a luxury marque without the interference of Jaguar and Jaguar in turn feeling less threatened by Triumph (whereas Jaguar under BL had to deal with both Triumph and Rover). I don’t think Jaguar pre-BL was threatened by Triumph. The only mooted Triumph product that was arguably a direct threat to Jaguar was the Stag, and we saw how that turned out. Post-BL, of course, there was a clash with Rover in terms of positioning, which lasted well into the development of the 800. Triumph was an issue mainly insofar as BL expected the three to share generally inadequate resources, since the mainstream brands were nominally supposed to be the priority. The mid-engined P9 was intended as a glamorous range-topper to take on the Porsche 911 and utilized components from the P6, along with the P8 saloon it loss out due to the Rover management being timid together with the BL board being dominated by Jaguar man who viewed the P9 as a rival to the E-Type and later the XJ-S.
Sir William’s defensiveness over Jaguar’s position aside, I think passing on it was the right decision. I have a hard time seeing it finding a market — it was too much of a brand stretch for either Rover or Alvis. Of course, all this is far afield of the Mini! Issues with body suppliers seem to have played a role in the downfall of many automakers! What’s ironic about this, at least with respect to British Leyland cars, is that BL was unmanageable because it was so sprawling, with so many subsidiaries. Finding alternate sources for spark plugs/shock absorbers/gaskets must be much easier than finding them for body shells. While he went with BMC in Sir William Lyons autobiography, it is mentioned that had Leyland’s Sir Henry Spurrier not retired in 1963 Lyons would have voluntarily had Jaguar become part of Leyland since Lyons respected Spurrier. In retrospect it would have been interesting exploring that path by having Leyland effectively become Jaguar-Triumph where both marques compliment each other instead of overlapping (as was the case with Triumph and Rover), with Rover remaining either an independent concern or part of BMC (managing to recover somehow). Going back to the Mini while liking the 9X and related ADO16-replacing 10X projects, BMC would have been better off taking an evolutionary approach by updating both the Mini as well as ADO16 (with the latter perhaps even spawning a shortened ADO16-derived variant in between both models called the Super-Mini). A wonderfully written article on one of my favorite cars (Cooper 997 owner since 1992). I’m going to nitpick a bit, in all the time I’ve been involved with Minis the engine was turned around (carbs facing the firewall) to prevent carb icing. The gearbox survival angle is interesting, although I’m not sure how much a bit of extra slop in the drivetrain by the intermediate gear will prevent transmission damage. And the floor pan leak issue was supposed to be a problem with production workers overlapping the floor pan pieces incorrectly. Was that the truth, or the engineering department deciding to blame the assembly line workers rather than admit they made a mistake? All my Minis are MkIs, they truly are larger on the inside than the outside. I did realize early on in my ownership that in a bad accident it’d be simpler to just crush the car with me in it to make my casket. Thanks to Alec Issigonis for the great handling that has saved me to date! Blaming assembly line workers for failures of engineering or management was a time-honored tradition of the British car industry, so there’s that. The Mini was not well-designed from a manufacturing standpoint — that is, its assembly required too many operations of too great a complexity — which clearly had a cost in assembly quality as well as labor costs. That sort of thing is really beyond the scope of lineworkers. It’s like if a fast food restaurant supplied each half of each hamburger bun in two pieces that the employee was supposed to assemble in preparing each burger, and then complained that the results were sloppy and took too long. So the Mini’s heel and toe panels both spot-welded onto the upper suurface of the floor pan. That’s fine for the heel panel, but it left huge unsealed gaps between the spot welds on the toe panel through which the airstream of the car would push rain water and road spray in quite incredible quantities – enough for the cabin to be three inches deep in water within a couple of hours of moderate wet-weather driving. The solution, handled by Griffin (because by this time Issigonis was wrapped up in the ADO16), was to redesign the toe panel so it welded to the bottom of the floor pan rather than the top, thus blocking the gap. Apparently Issigonis was predictably angry that his vision had been distorted, even though BMC never had any intention of undertaking low-tech CKD production as Issigonis envisioned (another example of him designing the car he wanted, rather than want his employers or their customers, needed). The Mini’s overly-complex body structure and spot-welded construction means they most of them still leak like sieves. My March 1960 Austin Se7en, even though it has the ‘fixed’ floor pan, still fills with water via the sills and the A-pillars. As for the 9X, I believe it really showed that Issigonis had learnt his lesson. I’ve looked over the surviving example in the metal and it’s a beautifully simple car. It has less than half the number of components as a Mini. Moulton’s ingenious but complicated suspension is ditched in favour of MacPherson struts at the front and torsion bars and trailing arms at the back. The all-alloy through-bolt construction engine is a thing of beauty and promised so much (all the more surprising given how dire Issigonis’ other engines were – the Alvis V8 he designed was hopeless and the BMC E-Series was a mess). No more transmission in the sump, but instead mounted in a seperate casing behind the engine. The 9X design (both platform and drivetrain) was scaleable – the prototypes were 3-door ‘Mini’ size, but Issigonis also designed a larger 5-door ‘ADO16’ size and there was room in the design for a bigger ‘ADO17’ size. The engine design scaled from 750cc 4-cylinder to 2.2-litre 6-cylinder. The 9X’s weakness was that while it would have been cheap to build and cheap to own it would have incurred massive setup and tooling costs because it was a completely clean-sheet design. BL simply didn’t have the resources even if the managerial and political will had been there. Cheers, Jack — I hadn’t know the roots of the original floorpan issue, although I know the Mini’s marginal profitability had much to do with it being overly complicated to manufacture and assemble. Your final graph, of course, is essentially the epitaph of British Leyland in the ’70s and ’80s. They knew they were barely making money from the Mini and were greatly dependent on it commercially, but they couldn’t afford the cost of reengineering it to make it cheaper to build until the extremely belated launch of the Metro. You mention the through-bolt construction of the 9X engine. Did this influence the later Rover K series engine? I’m sure the 9X influence was there on the K-Series, although I don’t think it was direct. The 9X itself drew on the original Austin Seven engine of 1924 (an engine that Issigonis was very familiar with given his time spent building Seven-based racing specials). I said in my original comment that the 9X was all-alloy, but it wasn’t – like the Seven engine it had an aluminium alloy head, a cast iron block and an aluminium alloy crankcase all held together in a ‘sandwich’ by through-bolts. It had some other typically Issigonis features – the alternator was built into the flywheel, after he was convinced to give up his original idea for magnetic segments bonded into the rubber timing belt and passing through a pick-up gate like some weird power-generating tape player! The K-Series was born from Charles Spencer King’s ECV3 project in the early 1980s. That car had a purpose-built 1113cc engine which was, in principle, a smaller all-alloy version of King’s multi-valve Triumph slant-four but with three cylinders. It required through-bolt construction to gain the required strength and rigidity with low weight (the whole engine weighed just 85kg ‘wet’). So the 9X did not directly feed into the K-Series but 9X engine prototype units were still kicking around Longbridge in the early 1980s – Issigonis’ three 9X-engined ‘gearless’ Mini development vehicles were there and they built a six-cylinder 9X Metro in 1985. I’d be very surprised if the knowledge of the 9X and its construction wasn’t common currency in the engine design office at Longbridge and so was an obvious solution to the requirements of the ECV3 engine and then the K-Series. Have read elsewhere there were concerns about the 9X’s gearbox layout during a comparison test, though the 9X still compared very well in other respects. Is there any truth to claims the 9X engine basically a downscaled E-Series in some respects given certain similarities between the two engines? Alleged there were said to have been similarities between the E-Series and Volkswagen EA827 (as well as the downsized EA111) engines, with the Volkswagen engines giving a hint as to what a well executed E-Series could have become. Also find it curious there was still scope in the 9X/10X project for a larger ADO17 “11X” replacement and 2.2-litre 6-cylinder, where can one find more information about such proposals? In the case of the 2.2 6-cylinder 9X unit, are you referring to the 9X gearless prototype that featured a larger 1.5-litre displacement version of the 9X engine? Was that the largest displacement the 9X 4-cylinder was capable of or could it have been stretched to displace 1.6-litres? It is also said that Issigonis planned for the 9X engine to feature twin-cams had it reached production.